Monster Mixers and Elixirs Review! Hello again all! I hope everyone had a great long weekend (for those in the US). I had planned to post on Monday, but I realized a little late last night that ‘Sunday’ was actually Monday. Three day weekends always mess with my head! So you may see 2 posts before the day is over! Today I have a review for you all: Monster Mixers and Elixirs! This is a new franken polish store run by Melissa of Be Someone Cute. They’re offering quite a few beautiful glitters, which can be purchased on their own, and some beautiful pre-made glitter topcoats. You can even buy a few mini bottles filled with polish base and sample sizes of glitters to make your own combos! I have 3 of their glitter topcoats to show off, as well as my own franken using glitter purchased from the store. 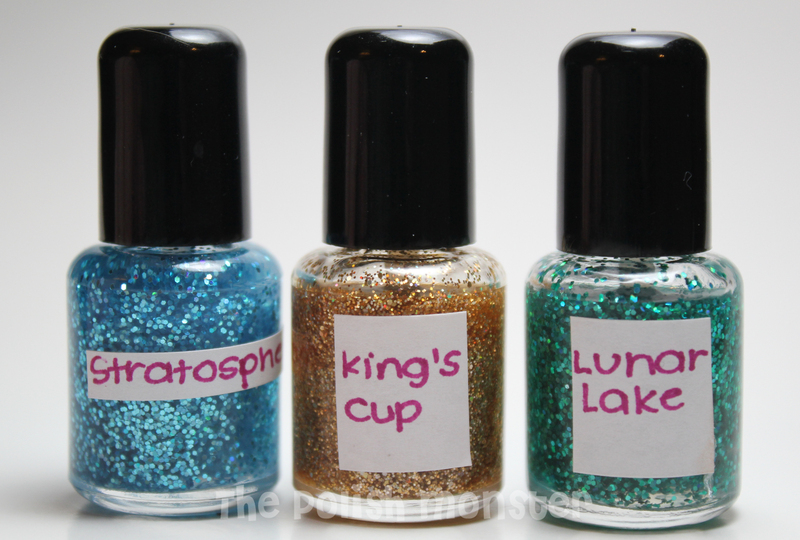 I recieved Stratosphere, King’s Cup, and Lunar Lake glitter topcoats. All 3 are very pretty! First up, I’ll show off Stratosphere. Stratosphere is a beautiful holo blue glitter. I layered this color over 2 coats of Orly Preamp. This glitter applied wonderfully, though I did have to dab a tiny bit to get it everywhere I wanted. I have 1 coat of Stratosphere on my pinky and ring fingers, 2 coats on my middle finger, and 3 coats on my index finger. King’s Cup is a beautiful, finer grade gold holo glitter topcoat. I layered this over 2 coats of Maybelline’s Downtown Brown. Application with this one was wonderful- smooth and pretty full coverage. Like the first shot, I have 1 coat on my pinky and ring finger, 2 coats on my middle finger, and 3 coats on my index finger. This is a finer grade glitter than Stratosphere and Lunar Lake, so the coverage is a bit fuller- it’s not as easy to distinguish between the different numbers of coats! Last but not least, we have Lunar Lake. Lunar Lake is a beautiful green holo glitter that is actually a bit more teal than my photos are showing. I layered this one over 2 coats of Wet N’ Wild’s Fergalicious- I love green and pink combos! Like the other 2 colors, this one is 1 coat on my pinky and ring fingers, 2 coats on the middle finger, and 3 on the index finger. The glitter went on smoothly and nicely, and built up well. It was a nice little pop of color contrast! Now I’ll show off one of my personal frankens I made the other night using glitter from Monster Mixers & Elixirs. I purchased a few different sample sizes of glitter to play with- for this, I decided to add the entire sample of Nebula to a bottle of base (I used a full size, which is why the glitter is a little less dense than the above topcoats- the sample sizes are perfect for mini size glitter topcoats on their own). I also added some of my new black stars and green moons that I recently bought from Glitter Unique. Named by and created for my friend Jen of Jen’s Nail Files, this one is called Vat of Bats. Nebula is a beautiful fine holo black glitter! This was 2 coats of Vat of Bats over 2 coats of Essence Grey-T To Be Here (which Jen actually gave me for my birthday- we like to swap gifts!). All I did was add the packet of glitter into my base- which I already own, but you can purchase in bottles from Monster Mixers & Elixirs. A scoop of the moons and stars were the only other things added. If you’re new to polish making, just want a glitter topcoat, or are an experienced creator looking for a few new glitters, be sure to check out Monster Mixers & Elixirs! You can also find Melissa at her Facebook page Be Someone Cute! This entry was posted on September 4, 2012 by The Polish Monster. It was filed under Uncategorized and was tagged with Be Someone Cute, franken, glitter, indie, Monster Mixers and Elixirs.